Doge: What’s it like to own a shiba inu? What’s It Like to Own a Shiba Inu? Shiba inus are awesome dogs, and they definitely have very unique personalities. This is our shiba inu, Hoju (semi-obscure Simpsons reference), at our wedding. He’s now 10 years old, but when we got him, he was only 8 weeks old and could fit in the palm of your hand. 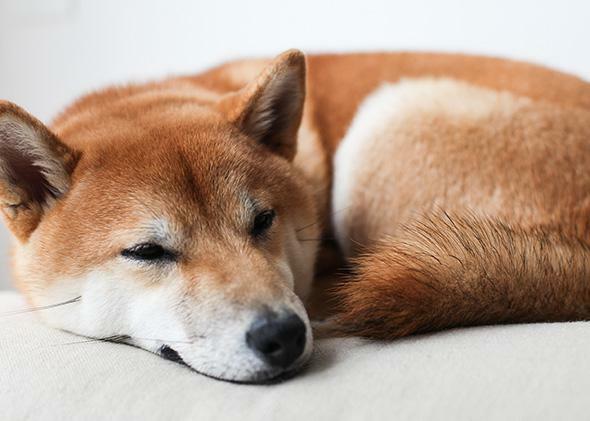 Like all dogs, shibas are extremely food-motivated, love to play with toys, and spend a lot of time itching themselves and sleeping. But, personalitywise, they are pretty different than most dogs. Shibas are independent. If you’re looking for an affectionate dog that loves to cuddle and craves attention, shibas are not it. Hoju pretty much follows us around everywhere, but he’d much rather be a few feet away than in our laps. He only likes being pet on his terms. Shibas are loyal and territorial. Shibas tend to really love their owners but not care so much for anyone else. And as a result, they worry a lot about protecting their owners, so they’re very territorial. When Hoju meets other people or dogs in public, he’s totally calm, but when people come to our house, he goes nuts. Anytime friends come over, he barks really aggressively at them for about two minutes, just so they know who’s boss, and then he totally gets over it. He’s a really awesome dog when it’s just me and my wife at home, but all of our friends think he’s a jerk because of how territorial he is, which is actually a big part of the charm because everyone tries to play a game to see who can get away with petting the jerk-dog. Hoju is not amused by this game. Shibas have a ton of energy when they’re young. As a puppy, Hoju used to just spend hours running sprints around our apartment. We would take him to the park and he would just explode—he especially liked to provoke dogs five times his size. Shibas also aren’t really off-leash dogs, so if you take them to public parks, you really shouldn’t allow them off-leash unless the spaces are enclosed or there’s enough space that you’re away from streets. Having an enclosed backyard helps a lot. Shibas clean themselves, just like cats. As a result, they don’t really get that strong dog smell as much as other breeds. Shibas shed a lot. A few times a year, shibas go through a massive shedding period, with dog hair everywhere. Pretty much forget about wearing black while this is happening. Dog Breeds: What are the dog breeds used by the Secret Service K9 unit? Dogs: What is it like to be a dog on an airplane? Dog Breeds: What dog breeds have the cutest puppies?